The London Underground: what it is and how to use it? This post is about the London Underground, also known as the Tube: a mass transit system in London, and my experiences while using it. I visited the UK between February 25th and March 1st, and thought I should write a post about it, since I've been a long time fan of the network. The first section of the Underground was opened in 1863, between the stations that are today called Paddington and Farringdon. It was operated by the Baker Street & Metropolitan railway, which continued to extend its network in the late 19th and early 20th century, and soon other companies began to build their own lines as well. In 1933, all the competing operators were merged under the London Transport Board, which is the predecessor to the current operator of the Underground: Transport for London. The first sections of the tube were built by digging up the street above the new line, laying down all the tracks and infrastructure, then covering it back up. This method was known as the 'cut-and-cover' method, and the Metropolitan, Circle, Hammersmith & City and District lines were built using this method. Other lines are known as the 'deep tube' lines, which were built using tunnel boring machines. These tunnels are much smaller, and the trains are as well. The latest addition to the Tube is the Jubilee line extension from Westminster to Stratford, opened in 1999, and the newest station on the Tube is Wood Lane, opened in 2008. One of the most recognisable features of the network is the map. Unfortunately, due to copyright issues, I cannot post the famous 'Tube map' here. You can find the latest on the website of Transport for London. I will, however, describe as much as I can. The London Underground has 11 lines, and operates in all boroughs of London, and extends outside of Greater London as well. The service is very frequent in all parts of the network, with even the outer reaches having trains every 5 minutes nearly throughout the day. The Tube shuts down for weeknights, but there's a limited Night Tube service on Friday and Saturday nights on select lines. The Tube has 270 stations, and the sprawl and fame of the network has led to many enthusiasts want to visit all the stations in as little time as possible. This is known as The Tube Challenge, and requires a person to either enter or exit a station, or be on a train stopping at it, for all 270 stations of the network in as little time as possible. This is record is officially tracked by Guinness World Records, with the current record at 15 hours, 45 minutes and 38 seconds held by Steven Wilson. Can you beat his time? The Tube operates a zone-based fare system, with the fare amount depending on how many and which zones you travel through. Single fares can be bought from ticket machines at any station from anywhere to anywhere on the network, and you can find out the cost by using TfL's Single Fare Finder. There are many ways to pay for your journey, however I recommend visitors to use the Oyster card, which is a stored-value smart card that automatically charges you the cheapest fare for your journey by recording the stations you entered and exited from. There is also a daily fare cap, which varies depending on the zones you travel through - if you hit the cap, all other journeys on that day are free. Visitors who have contactless payment cards (NFC-capable) can also use them to pay for fares, just by tapping them on the same Oyster card readers. TfL adds up all your journeys at the end of each day, and charges for all of them at once. Both of them are also valid on buses and other trains in the London area, including Heathrow and Gatwick Express (although they charge expensive, premium fares). For people who wish to not use the Oyster card, paper tickets are also available. Day travelcards from Zones 1 to 4, 6 or 9 can be bought at any ticket machine, or single tickets between two stations. Keep in mind that this is more expensive than using Oyster. The London Underground, being the oldest underground system in the world, has a lot of old infrastructure, but it is being heavily modernised. The sub-surface lines (Circle, District, Hammersmith & City, Metropolitan) lines use new S stock trains, which have walk-through carriages and air conditioning. On the other hand; Northern, Central, Jubilee and Victoria lines have automatic train operation: all the driver does is press operate the doors, and start the automated system. This means that trains can now run faster and more frequently, and TfL runs 40 trains per hour on the Victoria Line in peak hours - a train every 90 seconds. 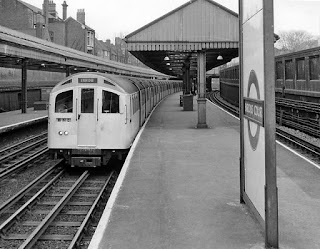 However, Bakerloo and Piccadilly lines use 1972 and 1973 Stock trains respectively - the oldest trains on any mass transit network in the world. TfL is in the process of acquiring new trains, but they aren't expected to enter service until 2023. These lines are also prone to more failures, as they still use old signalling systems. I've been a fan of the London Underground since 2011, and what I really like the most about it is the high frequency - you can get from anywhere to anywhere on the network, without even having to check the schedule. Many passengers don't even know that there is one! What I also like is the Oyster card system - it's simple to use and understand, and is also integrated with other rail operators in London. However, the Tube isn't perfect. Due to the age of the network, there can be failures, or planned engineering works, especially on weekends. Always check your travel at the TfL website. Also, while Osyter seems simple at first, the exact calculation for a fare is very complicated, and can vary depending on what route you take or which rail operator (or combination of those) you use. Still, I recommend all visitors of London to use the Tube, since it's much better than the alternative - driving. And the Tube is very cheap off-peak - you can travel between zones 2 and 6 for only £1.50. I went on a trip to the UK from February 25th to March 1st. This was my first solo trip to the UK, but 8th overall to the country. 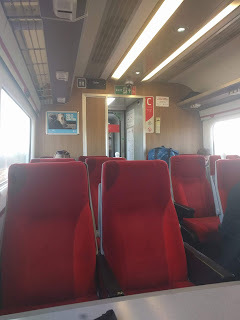 This post will be on how I travelled within the UK: on trains, using the BritRail Pass. What is a BritRail pass? The BritRail pass is a multi-use ticket for rail travel in Great Britain for visitors to the UK. BritRail was created and is managed by Rail Delivery Group (more commonly known as National Rail) - the organisation overseeing and coordinating operations of the 23 privately run passenger rail carriers. In addition to the 17 franchised carriers, BritRail is also valid on express trains serving airports around London, but is not valid on the London Underground or any other local light rail service. The BritRail pass also has special offers for museums and other sights across the UK. 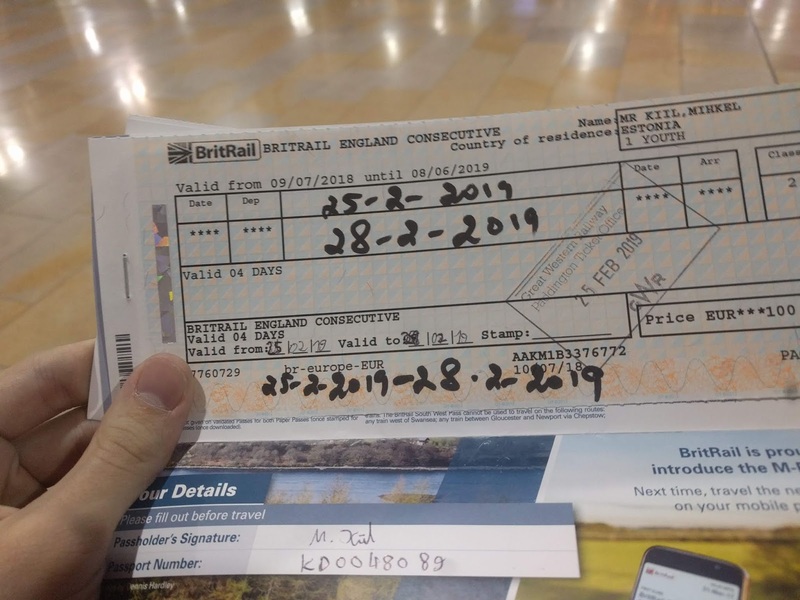 BritRail passes are available for several areas of the UK, and for different periods - either consecutive or flexible (e.g travelling on 5 days out of 15), and is available both on paper and electronically for smartphones (M-Pass). Full details can be found on the official homepage, and passes can be bought from rail travel agencies, such as ACP Rail, where I purchased mine. The first step to using a BritRail Pass is buying one from a travel agency, such as ACP Rail. BritRail passes are not available in the UK - you must buy one before you travel. I bought a consecutive 4-day paper pass for England only. I also added pass protection, which covers loss and theft of the pass. My total came to €119, including express delivery included with pass protection. I would personally recommend the M-Pass though, as you won't have to pay for delivery or protection, and for other reasons you'll see later. Once you've arrived in the UK want to start travelling on trains, your paper pass must first be validated. If you have an M-Pass, you don't have to - you have to select the dates of validity during the purchase process. Paper passes must be brought to a staffed ticket office at a National Rail station, where it will be marked with the range of validity and stamped with the start date. Users on flexible passes must also write down their dates of travel in sequential order on the pass. When your pass is validated, then the next step is to get on a train and enjoy your travels! However, as most stations have ticket barriers which can't read your pass, you must show it to a member of staff to be let through. M-Pass users again won't face this problem, as many barriers are fitted with bar code readers, which can read the pass. On an 'HST' train towards King's Cross from York. I couldn't have gone there without BritRail. 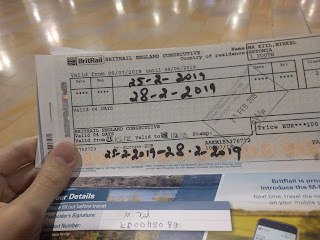 As stated before, I used a BritRail consecutive 4-day pass for England on my travels. My first trip on a train was a Heathrow Express service to London Paddington station, starting at Heathrow. I found out there was no ticket office which could validate my pass at Heathrow, so I had to travel to Paddington first. Fortunately I was told by members of staff that it's OK to use it, as long as I fill in the dates of validity myself. Most of my travels went without a hitch. Every ticket barrier however was a minor inconvenience for me though, as I had to get my pass out of my backpack and show it to a member of staff to be let on to the platforms. Fortunately this didn't cause me to miss any trains, but I will be using an M-Pass the next time to avoid this issue. Guards on the trains seemed to be OK with my pass as well, even though they probably only see them once every few months at best. One guard on a train from York to King's Cross didn't like that I had the dates of validity filled in myself, even though they were written again twice by staff at Paddington in marker. He let me go that time, but warned me that he'd charge for tickets next time. This was fortunately the only encounter like this. I recommend BritRail for anybody visiting the UK outside of London and thinking of taking the trains. Within London it is mostly not valid, and visitors would get a better value of using the Oyster card, on which there will be a post on in the future. BritRail passes provide a great value for anyone taking long distance trains, as tickets can get rather expensive. For shorter journeys however, it might be best to buy regular tickets from ticket machines. It all depends on your individual travel plans and budget. This post is all about the Tallinn-Stockholm ferry service operated by Tallink. I went on a cruise on this route on December 26-28, and this is a post about my experiences on that ferry, and also a general guide to the service, as I've been on these ferries several times over 12 years. Regular ferry service between Tallinn and Stockholm began on June 16th 1990, when MS Nord Estonia departed Stockholm for Tallinn, operated by EstLine - a joint venture between Estonian and Swedish shipping companies. In 1993, MS Estonia took over the route from Nord Estonia, however her time was cut short by a tragic sinking on September 29th 1994. EstLine continued to operate the route until 2001, when the route was transferred to Tallink - an Estonian ferry company which had previously operated only on the Tallinn-Helsinki route. In 2004, Tallink received MS Victoria I - a brand new ship designed for running between Tallinn and Stockholm. She entered service on March 21st 2004, and remains on the route today. On May 1st 2004, following Estonia's accession to the European Union, a stop was added in Mariehamn, Åland, to allow duty-free sales onboard to continue. MS Victoria I was accompanied on the route by MS Regina Baltica until 2006, when she was replaced by Victoria's sister ship, Romantika, which had previously operated between Tallinn and Helsinki. She was transferred to the Riga-Stockholm route in 2009, when MS Baltic Queen, Tallink's newest cruiseferry, entered service between Tallinn and Stockholm. Tallink operates a daily service between Tallinn and Stockholm. Passengers can book a cruise - departing and arriving at the same city, with approximately 7 hours at their destination, or a single or return trip between the two cities. Passengers have a choice between 6 classes of cabins (8 on the Baltic Queen.) On a single/return trip, passengers may also bring a car, for an additional fee. They may also book a place in a shared cabin for a lower cost, while cruise passengers must book an entire cabin. A ferry departs Tallinn every day at 18:00 and arrives in Stockholm at 10:15. The departures alternate between the two ships, i.e when Baltic Queen departs Tallinn, Victoria leaves Stockholm. The departure from Stockholm is at 17:30, arriving in Tallinn at 10:45. The ships stop at Mariehamn on the way for 10 minutes, arriving at 04:50 when heading for Stockholm, at 00:50 when headed for Tallinn. For latest, up to date schedules and more traffic information including disruptions, check Tallink's web page on the service. A display at Terminal D in Tallinn, informing passengers of the ship's departure time. As the ships are designed for a leisure service, they have plenty of restaurants, shops, and entertainment on board. 2 decks of both ships are dedicated to public spaces. Deck 6 is where the shops are located. Passengers can buy sweets, alcoholic beverages, souvenirs, electronics, apparel and beauty products free of tax. Deck 7 is mostly for restaurants and bars - both ships have Grande Buffet, Grill House and Gourmet restaurants and the Sea Pub and Piano Bar. Baltic Queen also has a Russian a la Carte restaurant and a Cigar Club for smokers. There is a show bar, spanning the stern of the ships on decks 6 and 7, where most on-board entertainment activities take place. Inside is also a PAF Casino and arcade games. There is also a disco, childrens' play room, conference centre, spa with saunas and an information desk. Baltic Queen and Victoria cruiseferries provide a great experience for people looking for a holiday at sea and for people using it as transportation. While slower than flying, the price includes a night's stay in a comfortable cabin, saving a hotel bill. The best option for travellers on a budget is a shared place in a B class cabin, with a price of around 40-50€ for a one way trip. As passengers on a cruise must book an entire cabin, they are usually entitled to cheaper rates than passengers booking single or return trips. For example, I booked an E-class cabin for 70€ on my cruise, while a return trip on the same dates would've cost over 170€. The ship is best for group travellers, as the on-board activities are mostly planned as such. Additionally, it is cheaper, as a group of up to 4 people only need one cabin. However, groups should take dining costs into account as well. A dinner in the Grande Buffet costs 31€ when booked in advance, per person, and breakfast is 11€. I recommend passengers to bring food from home if possible, and have breakfast on land outside the ship. Overall, while I do recommend Tallink's ferry service for transportation and for group holidays, care should be taken when planning it, since expenses on board can go out of control. I would also use caution when booking E-class cabins. The stern thrusters cause vibrations while turning, and this can lead to an unexpected wake-up call as the ship arrives in Mariehamn at night. Hello, all readers. This is my first post on my new blog. I will be posting here write-ups of my travels, reviews of transportation systems, and also some tech related stuff. I am writing this on board a ferry coming back from my visit to Stockholm, and this post will be a guide and review of the public metro system in Stockholm. 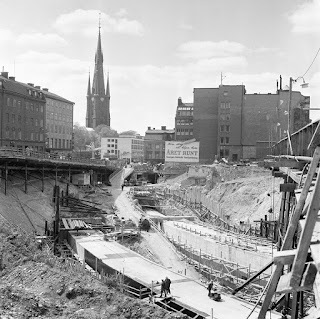 The first line of the Stockholm Metro opened in 1950. Prior to that, several tram lines were built to metro standards, to later form part of the metro system - these were called "pre-metro." By 1957, the former short sections of metro lines were connected at T-Central station, forming the Green Line. 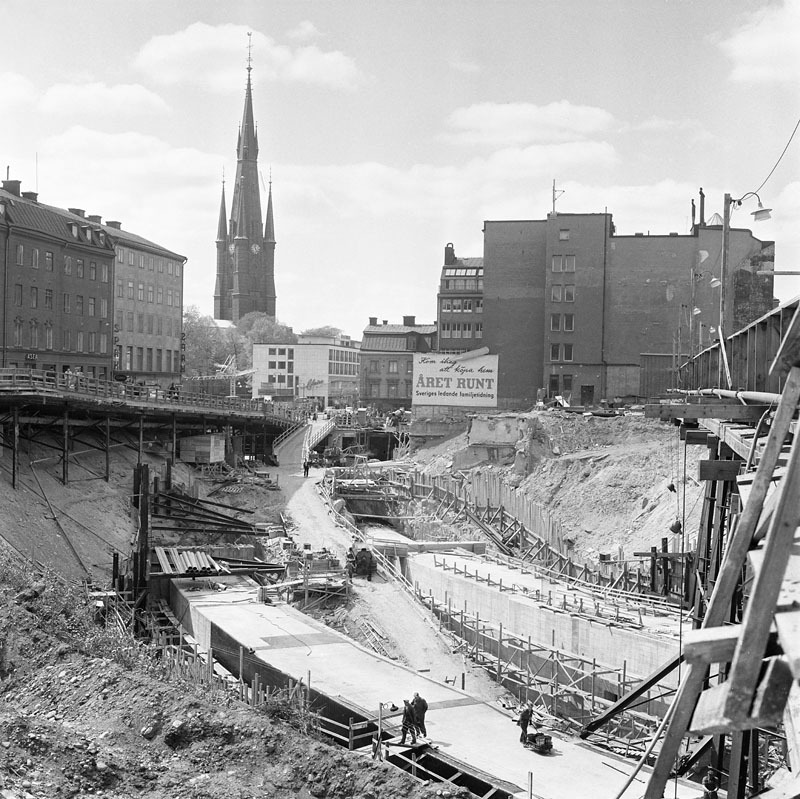 Later, the Red Line was opened in 1964, running from T-Central to Fruängen and Örsberg, and was extended to Mörby Centrum in 1978. By that time, the Blue Line had been running for 3 years, with 2 lines heading northwest of the city centre. The newest station, Skarpnäck, was opened in 1994, and is the 100th station on the network. The Stockholm Metro consists of 3 colour-coded routes - the former Green, Red, and Blue Lines. These are sometimes referred to as Subway Systems 1, 2 and 3 respectively. Routes are served by trains on different services, each with their own number. These run along the same route for the most part, but have different termini. There are a total of 7 different services. 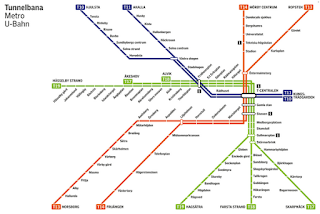 The Red and Green routes share tracks between T-Centralen and Slussen, and cross-platform interchanges are available. 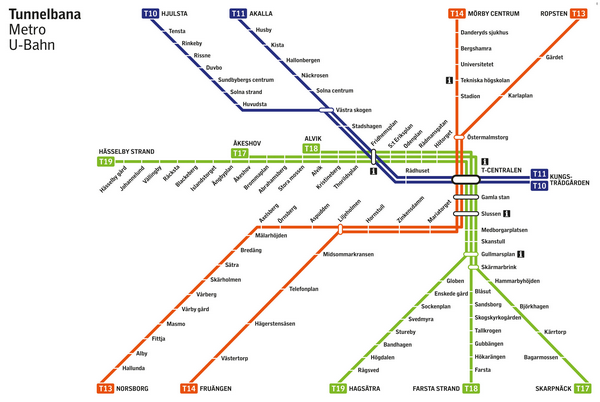 In addition to T-Central, there is only 1 other interchange station between routes on the network: Fridhemsplan. 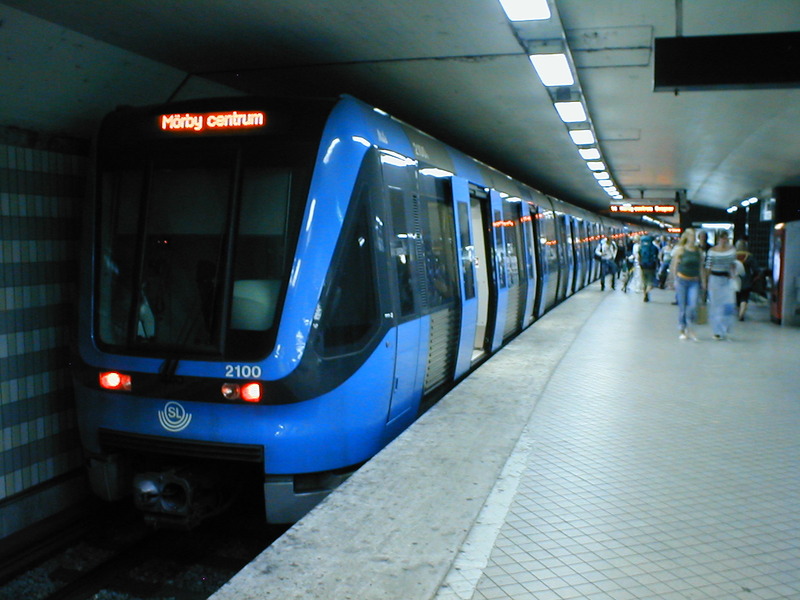 The Stockholm Metro forms part of SL's urban transit network within Stockholm, and accepts SL Access smart cards for ticketing. These cost 20 SEK, and are available from metro stations and Pressbyrån kiosks. These can be topped up with credit for single journeys, or time limited travelcards (e.g 24 hours, 72 hours, etc) for unlimited rides within a set time. There are discounts available for young people (under 20 years old), seniors and students in Sweden. A 24 hour travelcard for adults costs 125 SEK, 72 hours is 250 SEK, and 7 days is 325 SEK. For people entitled to discounts, they cost 85, 165 and 220 SEK respectively. For visitors who only make 1-2 journeys, paper tickets are still available from ticket machines and from the SL mobile app. A single ride ticket for adults costs 44 SEK, 30 for people entitled to discounts. The 3 systems of the Stockholm Metro operate on different signalling systems as well. On the Red and Blue lines (Systems 2 and 3) the old system is in use, manufactured by Union Switch & Signal, and on System 1 a newer system enabling Automatic Train Operation (ATO) made by Siemens. All systems use a 3rd rail power supply, with a nominal voltage of 650V on Systems 1 and 2, and 750V on System 3. There are 4 models of rolling stock in operation: the modern C20 trains, and the older Cx trains: C6, C14 and C15. C6 trains run on System 2, C14 and C15 run on System 3. C20 trains make up the majority of the fleet, and run on all lines. System 1 is the sole domain of the C20, due to the new signalling system. C6 units were built in 1970-1974, while the C14 and C15 were built from 1985-1989, both by ASEA. The C20 trains were built by Bombardier in Kalmar Verkstadt from 1997 to 2004. The metro in Stockholm was the first metro I ever took, and it is very well operated. The stations are clean, accessible, and the signage is clear - even for someone who speaks no Swedish. The C20 trains are modern, clean and comfortable, however drivers tend to handle the train a bit aggressively outside the Green Line, so make sure to hold the handrail when standing. The fares are reasonable, considering the purchasing power of the SEK. The Stockholm Metro is a good way to get around the city - for both locals and visitors. The largest internet service provider in Estonia is Telia Eesti, formerly operating as Elion. Along with broadband internet, they provide a TV service, using IPTV technology. Since this is a rather new technology, it has yet to be standardised, and every ISP operates it with their own parameters. As a result of that, customers are often required to use a router provided by the ISP, in this case Telia, to gain access to IPTV services, since they are distributed via the same broadband connection. However, with a bit of work, one can use IPTV with a router obtained through another party on Telia. IPTV, or Internet Protocol television, is a term describing the delivery of television content via the Internet Protocol. This is different from internet television, which is the delivery of content over the Internet. Even Telia offers such a service - minuTV. IPTV differs from that since it is only distributed over a restricted network (Telia's IPTV network), and requires a special device to view (a set-top box from Telia, such as an Arris VIP5305.) Telia's closed IPTV network is accessible to everyone who has this service activated under VLAN ID 4. The Inteno DG200A, DG301 and DG400P routers offered by Telia are pre-configured to connect to that VLAN, and the STBs on the local home network get their content by proxy from the router. Live TV channels are distributed as multicast groups, each with their own IP address, such as 239.3.1.1. To join one of these groups, an STB sends a request via the IGMP (Internet Group Management Protocol) to the entire network. The router receives the response, and forwards the request to the IPTV network, where the channel becomes available to the router. A live video stream will then be continuously sent to the whole local network, and it's up to switches on the network to filter out the stream (IGMP snooping). Telia's routers do this automatically, but if the STB is behind another switch, it might not do that. The stream will get to the STB, which will decrypt, decode the stream and play it on a connected screen. Recorded programmes, rental movies, and other non-live content is available by a standard video stream from the IPTV network. For this, the STB simply requests content directly from the server, and the router is set up to forward that request to the IPTV network, rather than the Internet. To use Telia TV with a 3rd party one router, one must first have the Telia TV service activated on their home broadband connection. This is tutorial only applicable to DSL or Fibre connections, it is not required nor possible on F4G. One must also have a 3rd party router, however special requirements need to be considered when buying one. It must support custom firmware, or be configurable to connect to VLAN 4 on the WAN side, in addition to the untagged internet VLAN. I personally used OpenWRT, however people have had success with earlier versions of DD-WRT as well. Information on hardware compatibility and flashing instructions can be found on their respective websites. Sandy Bridge, nor the author of this blog is not responsible for any damages caused by modifying critical system components of any router, gateway, CPE, or any other piece of network equipment. Flash firmware at your own risk! This is the end of part one. Part two will be on 2 ways to set up IPTV, with detailed instructions for both, on OpenWRT. If you need any Microsoft software from MSDN uploaded or mirrored, let me know.